I find Krugman’s proposition highly unlikely, even if it is possible. Dean Baker, as noted by Krugman, pointed out that saving seems to have declined as inequality rose. Dean suggests that the explanation is that “the increase in stock values relative to income in the 1980s meant that wealth was higher relative to income than would ordinarily be the case [and] we would expect this to lead to more consumption and a drop in savings.” Krugman is not convinced. He says that: “if your claim is that inequality causes a persistent shortage of consumer demand, you should find the actual strength of consumer demand problematic.” But that is Dean’s point, that consumption strength is not problematic because higher asset values allowed for consumption expansion. Let me illustrate the argument with two simple graphs. The first one shows the wage share in total disposable income (more precisely it is the Compensation of Employees, Wages and Salary Accruals, WASCUR, over Disposable Personal Income, DSPI; all data from FRED) and the share of Personal Consumption Expenditures (PCE) over Gross Domestic Product (GDP). 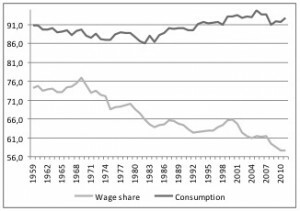 You can see that while the wage share starts falling in the 1970s, at that point in tandem with consumption, by the 1980s both series diverge, with consumption expanding while the wage share was contracting. Dean’s point is illustrated with the next graph that shows the Total Financial Assets – Assets of Households (TFAABSHNO in FRED) as a share of GDP. Note that by the 1980s, when consumed boomed in spite of a falling wage share, the assets of households boomed from around 200% to around 370% at the peak, right before the last crisis. 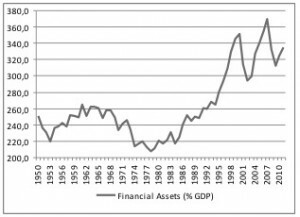 Note that in spite of the significant fall in the value of total financial assets, consumption, which collapsed during the crisis and bounced back, remains more or less fine, recovering since 2009. But part of the explanation is fiscal stabilizers. Unemployment insurance and other programs have allowed for continuing consumption. In other words, the increase in public debt is what has kept the economy going. But it seems quite reasonable, even if unlikely, to suggest that a higher wage share would allow consumption to grow on a more sustainable basis. So income distribution is one of the elements holding up the recovery, together with the inability and unwillingness of Republicans (and some Democrats too) to push for more fiscal stimulus. Do you see any role for private debt in that story? You made some decent factors there. I seemed on the web for the difficulty and located most people will go along with with your website.